The intense green of this chrome tourmaline from Tanzania resembles the color of emerald. Tourmalines come in a wide variety of exciting colors. In fact, tourmaline has one of the widest color ranges of any gem species, occurring in various shades of virtually every hue. 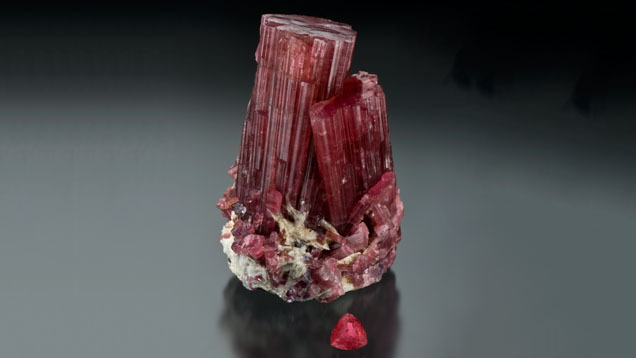 Rubellite is a name for pink, red, purplish red, orangy red, or brownish red tourmaline, although some in the trade argue that the term shouldn’t apply to pink tourmaline. 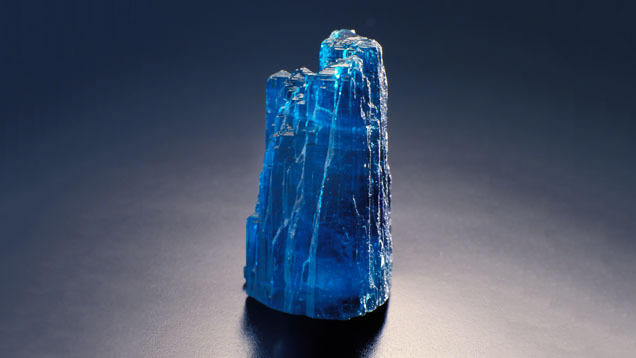 Indicolite is dark violetish blue, blue, or greenish blue tourmaline. Paraíba is an intense violetish blue, greenish blue, or blue tourmaline from the state of Paraíba, Brazil. Chrome tourmaline is intense green. In spite of its name, it’s colored mostly by vanadium, the same element that colors many Brazilian and African emeralds. 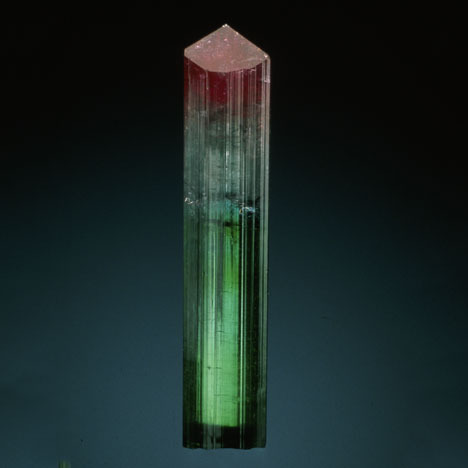 Parti-colored tourmaline displays more than one color. One of the most common combinations is green and pink, but many others are possible. Watermelon tourmaline is pink in the center and green around the outside. Crystals of this material are typically cut in slices to display this special arrangement. Copper is the element that contributes to this Paraíba tourmaline’s highly prized color. This attractive slightly brownish, orangy yellow tourmaline is from the Merelani area of Tanzania. Some tourmalines also show a cat’s-eye effect called chatoyancy. Cat’s-eye tourmalines are most often green, blue, or pink, with an eye that’s softer and more diffused than the eye in fine cat’s-eye chrysoberyl. This is because, in tourmaline, the effect is caused by numerous thin, tube-like inclusions that form naturally during the gem’s growth. The inclusions are larger than the inclusions in cat’s-eye chrysoberyl, so the chatoyancy isn’t as sharp. Like other cat’s-eyes, these stones have to be cut as cabochons to bring out the effect. A tourmaline’s chemical composition directly influences its physical properties and is responsible for its color. Tourmalines make up a group of closely related mineral species that share the same crystal structure but have different chemical and physical properties. They share the elements silicon, aluminum, and boron, but contain a complex mixture of other elements such as sodium, lithium, calcium, magnesium, manganese, iron, chromium, vanadium, fluorine, and sometimes copper. Gemologists use a tourmaline’s properties and chemical composition to define its species. The major tourmaline species are elbaite, liddicoatite, dravite, uvite, and schorl. Most gem tourmalines are elbaites, which are rich in sodium, lithium, aluminum, and sometimes—but very rarely—copper. They occur in granite-containing pegmatites, which are rare igneous rocks. Pegmatites are sometimes rich in exotic elements that are important for the formation of certain gem minerals. Pegmatites might contain very large crystals up to 1 meter (about 3 feet) in length. Because of the nature of pegmatites, different gem pockets within one pegmatite body can hold tourmaline crystals of very different colors. Or one pocket can produce a variety of differently colored tourmalines. As a result, many mines produce a variety of gem colors. Another feature of gem pegmatites is the scattered distribution of pockets within them. For miners, working a pegmatite consists mostly of excavating barren rock until the work results in the occasional and sudden reward of a rich pocket full of spectacular gem crystals. Elbaites offer the widest range of gem-quality tourmaline colors. They can be green, blue, or yellow, pink to red, colorless, or zoned with a combination of colors. Uvite is rich in calcium, magnesium, and aluminum. Dravite is rich in sodium, magnesium, and aluminum. Both form in limestone that’s been altered by heat and pressure, resulting in marble that contains accessory minerals like tourmaline. Some of the most important gem tourmalines are mixtures of dravite and uvite. They’re often brown, yellowish brown, reddish brown, or nearly black in color, but sometimes they contain traces of vanadium, chromium, or both. When present in the right concentrations, these impurities produce rich green hues that rival those of tsavorite garnet and, occasionally, even emerald. Dealers sell these gems as chrome tourmaline, even though they’re not always colored by chromium. The bright yellow gems some dealers call “savannah” tourmalines are also mixtures of dravite and uvite. Their coloring element is iron. Schorl is typically black, and rich in iron. It forms in a wide variety of rock types. It’s rarely used as a gem, although it has been featured in mourning jewelry. Tourmaline’s colors have many different causes. It’s generally agreed that traces of iron, and possibly titanium, induce green and blue colors. Manganese produces reds and pinks, and possibly yellows. Some pink and yellow elbaites might owe their hues to color centers caused by radiation, which can be natural or laboratory-induced. Explore tourmaline history, research, quality factors, and more in the GIA Gem Encyclopedia.